Having a baby changes your body; while some of you might like these changes, some of you may find it hard to get in terms with it. You may want to get back to looking as slim as you were before pregnancy even before you complete your term. Most women lose half of their baby weight by 6 weeks postpartum (after childbirth), but, it's important to understand that these changes in the body are necessary for your baby to grow well. Your body needs time to recover from child birth, give that time generously to your body. Be aware that you will be eating extra calories when you are breast feeding, in order to feed your baby and take care of your own health. Wait for six months and then you may concentrate on dieting. If you have had a C- section, you might have a little bulged stomach than a lady who has had a normal delivery. Do not worry about it as that's normal. • Typically, breastfeeding helps you burn calories. .So, it's obvious there are chances for you to put on weight once you stop breastfeeding. Hence, ideally you should start a weight loss regime only after you stop breast feeding. • Since breast feeding contributes to a gradual process of weight loss, you will see a slow process of weight loss while breastfeeding. Once you are about to stop feeding, your weight loss process might speed up. Do not stress about your weight by looking at the weighing machine. • Going on crash diets or fad diets (diets that make you eat less and lose out on important nutrients) would make you unhealthy. These kinds of diets would reduce your body fluids and essential nutrients. When you don't feed your body its requirements, it would extract nutrients from your body stores and there can be chances of you getting mal- nourished. 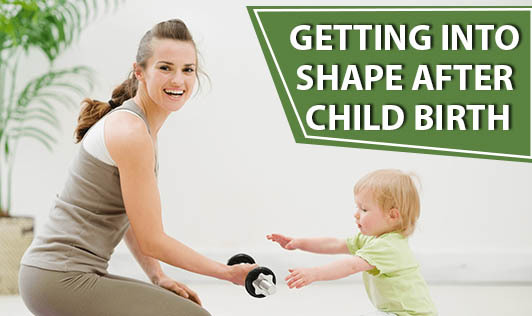 • Bear in mind that your body shape might change during pregnancy and child birth. You will need to exercise five days a week. Stay calm, practice meditation and perform some simple exercises at home. You can lose weight if you really want to, but in the right way!